First Line: By the fourth ring concern started to creep into my heart and mind. It's an ordinary day for professional indexer Marjorie Trumaine: she has a question for her friend Calla Eltmore, the local librarian. But Calla isn't the person who answers the telephone. No-- according to police, Calla has committed suicide. Suicide is a verdict Marjorie just cannot accept, and when she notices something wrong at Calla's wake, the police don't seem to care. That means one thing and one thing only to Marjorie. Despite looming deadlines with her publisher, despite caring for her blind and paralyzed husband, Marjorie is going to find the time to uncover the truth... and unmask a killer. It's not been that long since I last visited Marjorie Trumaine on her North Dakota farm in See Also Murder, and I was happy to be back. Sweazy knows how to put readers right in the middle of farm life in the 1960's, with party lines on the telephones, sewing your own clothes, proper funeral etiquette, and just "making do" in general. After what occurred in the first book of this series, Marjorie's comings and goings have been seriously curtailed. In some ways it doesn't bother her. Her husband Hank-- blinded and paralyzed in a freak hunting accident-- needs her, and her work as an indexer is done at home. But the mere fact of not being able to go somewhere when the mood strikes is crippling and shows just how isolated Marjorie has become. Her determined attempts to find Calla's killer is the best possible example of how much her friend meant to her. I like watching how Sweazy's mind works. Just as I foresee a problem that could affect future books, he lays the groundwork to take care of it. (What's done in See Also Deception really has me looking forward to the third in the series.) He can also make the hair on the back of your neck stand on end, such as the scene when Marjorie finds out her truck tires have been slashed and her telephone line cut. The killer is making a move, and Marjorie can't get away or call for help... what in the world is she going to do? Sweazy makes that farm house feel like it's a thousand miles to the nearest neighbor. The tone of See Also Deception is rather bleak, just as it was in the first book, but it's not a gray depressing weight that brought me down. I found Marjorie too interesting as a character, and besides-- with what that woman has to deal with should she really be laughing and kicking up her heels? (I think not.) But as I said before, changes are afoot, and I'm hoping that the author brings Marjorie a bit of happiness because she certainly deserves it. Time period-- check. Characters-- check. 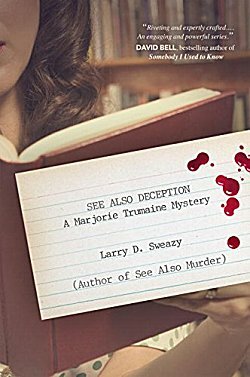 And Sweazy is also good at crafting puzzling whodunits, although I have to admit that I was a bit willfully blind as I read because of the sympathy I felt for one of the characters. Yes, people can live secret lives even in the smallest of towns, and Marjorie Trumaine is just the sort of character to bring those secrets to light. Bring on book three! I love it, Cathy - a professional indexer. What an interesting profession, really, and a solid choice for a mystery series. This one sounds like a good one, too. Oh, and I see your reading Marshall Karp's new Lomax and Biggs novel. I'll be interested in what you think of that; he has a real sense of wit. I enjoyed it, Margot. It was so good to see Lomax and Biggs back in action. Sounds interesting, will add it to the groaning TBR list. It is a very good series, Kathy. I remember "party lines" in the 1950s in Chicago. In our case, it wasn't a good thing, some angry people were on that line who didn't like children. Back in the little town where I grew up, the problem with our party lines was the gossips. When a particularly juicy bit of news came through, one of the gossips-in-chief would even go around town to check for houses that didn't have phone lines going in so she could spread the word. Well, in our case people who were angry about something took it out on children. Our gossips were bad enough.